Chipino is an electronics prototyping platform based on flexible, easy-to-use hardware and software. It's intended for artists, designers, hobbyists, students, technicians, engineers and anyone else interested in creating interactive gadgets. 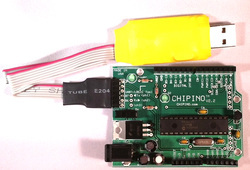 Chipino is not designed to replace Arduino, it's just another option. Arduino is a great platform based on the Atmel microcontrollers. But many people prefer the Microchip PIC microcontrollers. There is a seemingly endless supply of software examples and application notes available for the Microchip PICs but a common hardware platform was missing. With the success of the Arduino hardware, an opportunity existed to bridge the two worlds and connect the Arduino with the PIC and that is what Chipino is all about. 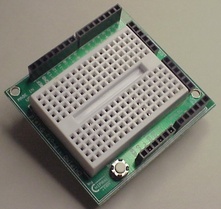 Chipino is actually designed to use the same footprint as Arduino so all the Ardunio shields can also be used with Chipino. 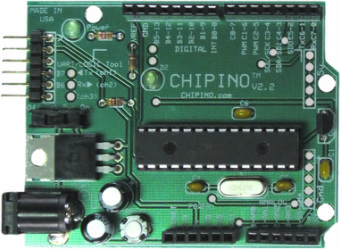 The Chipino is just another alternative for this great common hardware development format Arduino created. The best way to get started is to get a CHIPINO and a PIC programmer. There are many PICkit 2 Clone programmers that work great. The starter set below is a great place to start. Chipino Proto-Shield is shorter than most Arduino prototype shields. It's designed to allow access to the on/off switch and the communication connections for the PICkit 2 UART and Logic Tool features. The CHIPINO and CHIPINO mini are both used for the projects in Chuck Hellebuyck's book Beginner's Guide to Embedded C Programming - Volume 3 where he shows you how he created the Simple C library and how to use it with the CHIPINO modules.